This is Scout - our crazy Brittany. He was our first Brittany, but not our last. But because of Scout, we ended up rescuing our precious Kayla thru NBRAN. We got Scout when he was just a puppy and fell in love with this little guy and also the breed. 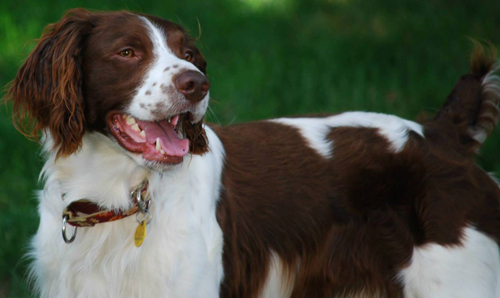 Scout was a crazy, funny, Brittany loaded with personality and love. He was "that dog" that touched our heart so deeply that we will never forget him. On June 4, 2014, we had to let him go. Our hearts were broken. When Scout was diagnosed with cancer in June of 2012, we were told he couldn't hunt anymore as it would be too hard on him with one lung and cancer throughout his lymph nodes. My husband felt so bad for his hunting buddy, and created a meadow out in our back yard so Scout could get out in the field a bit. Well, we had Scout with us until June 2014, and I can say that dog made his way down to walk around in that meadow every single day. I didn't realize until after we lost Scout how special it really was and only confirmed to me what a wonderful, caring man I married. My friend and dog-sitter sent me a photo of Scout with this message: "RIP Scout...your beauty and enthusiasm filled the world. I was very lucky to have known you sweet boy." And I can truly say that we were lucky to have had him in our lives. Miss you so much, my doodlebug. After Scout passed, our younger Brittany, Huckleberry, was so heartbroken and had such separation anxiety. We could not leave him alone. So, we decided that we needed another dog, but were not quite ready for a puppy. We searched the internet and found NBRAN. We were so fortunate to find NBRAN and because of Scout, we have another loving Brittany in our home. Precious Kayla made that long trip from Indiana to Maryland and we are so thankful!